Even in hard times, this is the holiday season and a time when thoughts turn to home and family and dinner tables covered with food and gaily wrapped presents and bright lights. Save a moment amid the celebrations to give thought to the hundreds of thousands of men and women in uniform in far-flung parts of this world who won't be sitting down to dinner with their families. More than 170,000 men and women of our military will spend their Christmas and New Year's in Iraq and Afghanistan, where killing and dying never take a day off. Oh, Uncle Sam will do his best to see that most of them sit down to a special dinner of hot turkey and dressing and all the trimmings, and even in the most remote outpost some soldier or Marine will jury-rig a tree of sorts with decorations of sorts. But it's a hollow celebration for a lonely soldier so far from home and loved ones, and lonely, too, at that dinner table back home where a chair stands empty at the head of the table. The holidays always bring the troops to mind for me. My earliest memories are of holidays during World War II when rationing of meat and sugar and all manner of things that we take for granted today made the feasting and gift-giving a lot more difficult. My dad and six of his brothers were all gone to war, along with four of my mom's brothers. I grew up in houses full of frightened women who were doing their best to make do on shortened rations and small allotment checks. My mother got $17 a month from dad's $21 a month pay. 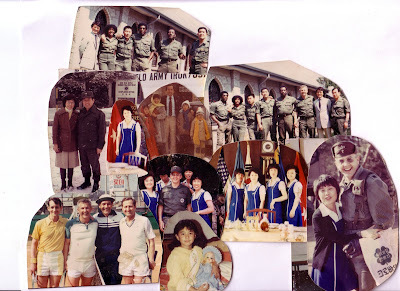 I have my own memories of holidays spent with soldiers and Marines in combat zones from Vietnam to the Persian Gulf to Iraq. 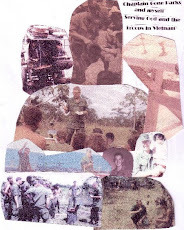 The first was Christmas in An Khe with the 1st Cavalry Division in 1965. The newly arrived division and my friends in the 7th U.S. Cavalry had been blooded in the previous month's terrible battles in the Ia Drang Valley. The memories of young men wounded and dying all around were fresh in our minds. The gaps in our ranks had been filled with green troops yanked out of replacement depots, and the new arrivals looked at the old, sad eyes of men no older than they were with awe, and we all wondered what fresh Hell we'd found ourselves inhabiting. And along came the Bob Hope traveling troupe to take our minds off the war for a couple of hours. Everyone howled at Bob's corny jokes and Jerry Colona's slapstick antics. Everyone's eyes bulged at the sight of a scantily clad Joey Heatherton dancing wildly around the stage. When it was over, most of us just sat there on the ground wishing it wasn't; wishing we weren't there; wishing that we were home in a crowded living room smelling the treats soon to emerge from a hot, busy kitchen. Then everyone got up, brushed the red dirt off their jungle fatigues and drifted back to their green Army tents and cots. Back to reality. Another memory is of Thanksgiving in the Saudi Arabian desert in November of 1990. I'd signed up to go eat turkey and trimmings with some unit, somewhere out among the sand dunes, when I was called to board a bus with two dozen other reporters and photographers. The bus would stop at an empty crossroads, and the guy with the clipboard would call off a name or two and drop them before moving on. My turn came, and I stepped off literally in the middle of nowhere. A tall captain of artillery stepped up and saluted: "Mr. Galloway, we are C Battery, 1st Battalion, 21st Field Artillery. We call ourselves The Falcons and you will understand why far better than anyone. 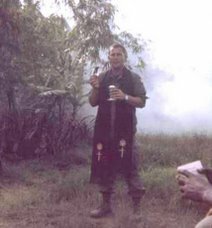 We provided fire support for the 7th Cavalry at Landing Zone X-Ray in the Ia Drang. "I stood there unable to say a word, tears rolling down my cheeks. Then I knew that somewhere in that cold, forbidding institution that is an Army, there was both a memory and a heart, and that heart was as tender as my own. I've never had so fine a Thanksgiving dinner as that one in an Army mess tent in a cold, windswept desert; never enjoyed the company and camaraderie so much as I did then and there. Used without permission but we don't think Joe will mind. **We think the President elect took a note from Joe and send a great message to the troops."